The AP Mobile iPhone App makes sharing on twitter easy by pre-filling in the text of the tweet for you. Here's how it works. Here's how it currently works in the browser when reading a news story. 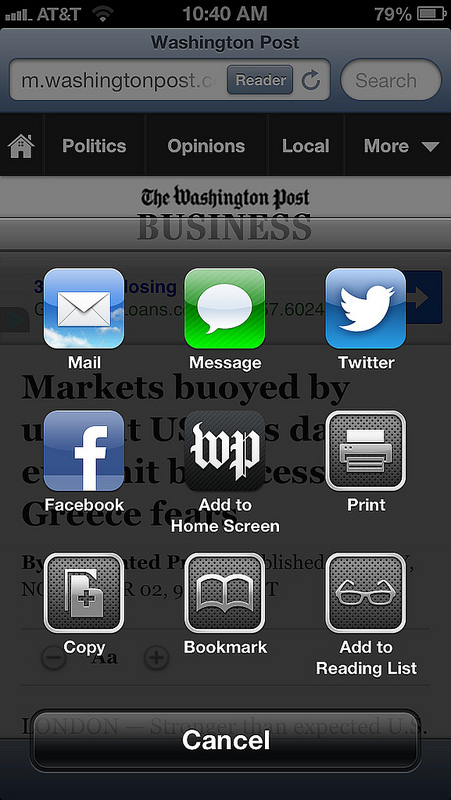 Click the SHARE icon and you get the iOS Social Media sharing screen. When you click to tweet something, the default tweet is BLANK. This means that you either have to type something into the tweet, or SELECT/COPY/PASTE text in from the thing you are tweeting. When you tweet something, on a Mac, with most apps, the text of the item title that you are tweeting usually gets pre-filled for you. After clicking the SHARE icon, the social media sharing page comes up, with pre-filled text of the story I was reading. I clicked to tweet it, and got a little green check mark when the tweet went out. The nice tips i have got from this post which is very useful for me as well as other people so thanks for sharing this information.AP mobile iPhone app is best app for sharing anything on social media.